These shoes will have everyone staring, but in a good way! The Florsheim Women's Dark Brown Steel Toe Internal Met Guard Work Shoes give you the protection you need while still providing you with the comfort you want in a work shoe! These work shoes have a Eurocasu ... (see full details) (see specifications) #FLSFE244. These shoes will have everyone staring, but in a good way! The Florsheim Women's Dark Brown Steel Toe Internal Met Guard Work Shoes give you the protection you need while still providing you with the comfort you want in a work shoe! These work shoes have a Eurocasual oxford style while still keeping their steel toe and internal metatarsal protection concealed. These work shoes were made specifically to provide you the protection you need but still maintain their comfortable features, to keep you happily on your feet all day long! They have a removable polyurethane cushion insert so you have the ability to remove and replace the cushion, so you can regain the same great feeling you had the first day you bought them. Plus, they have a direct inject, super soft PU midsole for additional comfort. The bottoms of these shoes were made with a hard wearing TPU bottom, so you know these shoes will work as hard as you do! Although they have a internal composite metatarsal guards with no metal on the top, they are still very flexible so you can move comfortably throughout the day. These Florsheim Women's Steel Toe Internal Met Guard Work Shoes will provide you with exactly what you're looking for. Plus, their brown leather look will help you to stay looking as professional as you feel in them! The men's style for these shoes is FE2440, so whether you're male or female, there is no excuse not to get choose work shoes! These safety shoes are fantastic! I have worn 7 different pairs of steel toed shoes and boots over the past three years that all eventually led to chronic foot pain. I had to switch to the metatarsal guard shoes for a new job, and so far I have had no problems with these. I highly recommend them! I have worn these shoes for a number years. After wearing the same shoes for almost 2 years with no problems, thought it was time for new ones. Order was fast, shoe looked same as other ones I ordered. But had a real problem when put them on. When shoe was manufactured the lining of the tongue was not a flat seam anymore and the seam was rolled instead. So after a few hours of wearing them the tops of my feet were in a lot of pain and after a couple of days hoping things would get worn in my feet were bruised on top. It's unfortunate that the change in the manufacturing process has destroyed one of the best steel toe-metatarsal shoe on the market. These shoes are very smart looking for a steel toed- meta shoe. Quite stiff at first but after you break them in they are comfortable. They have great support and are good for my back when standing up for an 8 hour shift. 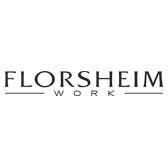 Florsheim Women's Dark Brown Steel Toe Internal Met Guard Work Shoes FE244 is being added to your cart.